NEW BRITAIN - As the Central Connecticut State football team filed into the locker room to escape the cold and the rain, it didn’t take long for the cheers and the music to blare out into the stadium. The looks of disgust, disappointment and anger from last week were gone and replaced. A 49-24 win, especially one in conference, will do that. Setting multiple records in the process doesn’t hurt either. Wagner (2-6, 1-2), meanwhile, was left to file out quietly to its waiting buses, battered and bruised from a sophomore running back and his offensive line. 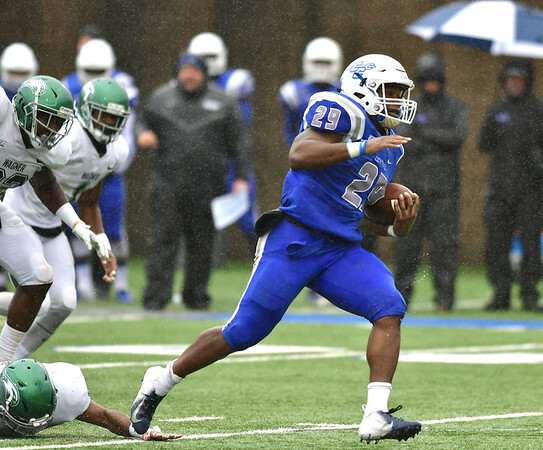 On a Saturday afternoon built for the Seahawks, who came in with the leading rusher in the FCS, Ryan Fulse, it was the Blue Devils’ Aaron Dawson who was the talk of the day after he finished with a single-game school- and NEC-best 361 yards. His five touchdowns tied another CCSU (5-4, 2-1) mark. The Seahawks knew what was coming. Even the fans in the stands, those who weathered the torrential downpour throughout the afternoon, knew what was coming. Wagner just couldn’t stop it. Nor did it look like they wanted to. After running for 53 yards in the first half, Dawson ran for an NCAA-record - FBS or FCS - 308 yards over the final two quarters, which included touchdown runs of 45, 57, 60 and 55 yards. At times, the Blue Devils might as well have been hitting a replay button. The runs of 57 and 60 came on back-to-back plays on back-to-back possessions for the offense in the fourth quarter. It was the kind of game CCSU head coach Pete Rossomando often talks about, not in terms of yards, but in terms of effectiveness. In other words, as the Blue Devils’ ground game goes, so too do the Blue Devils. It’s what made CCSU such a dangerous team last season, when it capped off the regular season with eight-straight victories to win the NEC. It’s also what the Blue Devils have been trying to do consistently this year and might have finally. Dolegala and the receivers have shown they are plenty capable of making big plays. The signal caller has a pair of 320-plus yard passing games on the season and just three interceptions. But the passing game often works at its best when CCSU is able to run the ball effectively when opponents begin to stack the box, leaving room to take shots down the field. And yes, having a defense that’s able to come away with multiple turnovers like the five the unit had against Wagner never hurts either, but again, it all starts with the ground game. In all five of CCSU’s wins this season, the Blue Devils have had the advantage in rushing yards. They outran Division II Lincoln (Pa) 246-45, Fordham 97-72, Robert Morris 358-219, Bryant 442-97 and Wagner 396-156. That’s a 1,539-yard to 589-yard difference and it’s resulted in CCSU outscoring its opponents 232-86. In their last three wins - against Robert Morris, Bryant and Wagner - the Blue Devils have had three 150-plus-yard rushers. Drew Jean-Guillaume ran for 157 yards and three touchdowns against the Colonials and another 203 yards against the Bulldogs. Then there was of course Dawson’s performance Saturday. In its four losses, CCSU has outrushed its opponents twice - against Lafayette and Sacred Heart - and been outran by a combined 705 yards to 610. David Cinti, J’Von Brown, Cole Phelps, Connor Mignone and Jake Schena have formed into quite the group upfront for the Blue Devils. Add in tight end Arthur Gilmore, Jr., and it often leads teams being overmatched. CCSU knows what its opponents are going to try to do over these last two weeks against St. Francis (Pa) and Duquesne following the Blue Devils’ bye and have been this season. It will just be a matter if those teams are going to be able to. That of course, will be the key. Posted in New Britain Herald, CCSU on Tuesday, 30 October 2018 19:08. Updated: Friday, 15 February 2019 15:49.